Arts Alive! is an arts event like no other. It’s a celebration of all local arts; an opportunity to honor outstanding regional artists, arts leaders and arts supporters who give their time and talent to enriching our creative community; and one of the community’s premiere arts events! We invite you to be part of this signature fundraiser for Summit Artspace by becoming a sponsor. Arts supporters, businesses and foundations have always been generous to Summit Artspace by supporting programs and events like Arts Alive! We depend on your support to continue a tradition of honoring best and brightest area artists, arts organizations and arts leaders with the Arts Alive! award. However you choose to target your support, your dollars will help Summit Artspace fulfill our vision of showcasing the best local arts and building a creative community that demonstrates the value of arts to our quality of life. Your financial support in any amount will not only support the Arts Alive! event, it will enable us to better serve the needs of our local arts community by extending more exhibition opportunities to artists, students and art groups, continuing to offer affordable studio and office space to arts entrepreneurs, providing engaging and interactive art-related educational programs, integrating more quality performing arts, and hosting collaborative events that engage diverse audiences throughout our community. We rely on generous support from all who value providing arts opportunities and recognize the role all art plays in enriching people’s lives. We simply cannot make it happen without you! 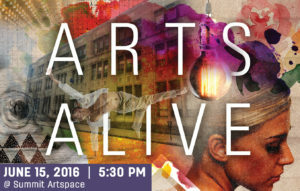 We ask you to consider sponsoring Arts Alive! at any level. With your gift, you will be investing in the future of your community art center – a place where all people can create, educate and participate in great art experiences. Click here for sponsor levels and commitment form, or contact Joanne Green, Executive Director or Brenda Cummins, Arts Alive Chair, to discuss the right sponsorship options for you. We truly appreciate your support. Thank you!